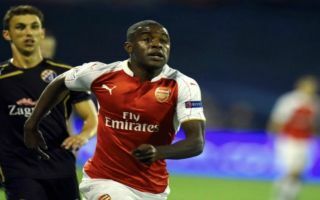 Arsenal forward Joel Campbell has left The Emirates to join Frosinone Calcio in Serie A on a permanent deal which ends his 7-year affiliation with the Gunners. Campbell’s spell in North London has been one dogged by inconsistency, amid unconvincing performances and an inability to break into former boss Arsene Wenger’s first-team plans. The Costa Rican was loaned out in each of the last seven seasons, to six different teams, including Real Betis, Lorient, Olympiakos and Villarreal. His best form came in Greece with Olympiakos back in 2013, where he played over 30 games and contributed 8 goals, impressing with his direct style of play and ability to play on either flank as well as in the middle of the pitch. Last year he played in Spain with Betis – his second spell with the club – but failed to make more than 8 appearances, contributing just 2 goals in the process. According to Arsenal’s official website, the 26-year-old has now called time on his career at The Emirates, opting to join Frosinone in Italy permanently and finally break the cycle of constant loan deals. The Daily Express reports that the former Gunners striker will sign a deal that will keep him with the Serie A outfit until 2021, as he finally leaves the North London club having made just 40 senior level appearances overall, never managing to fulfil his initial promise after joining from Deportivo Saprissa back in 2011. Campbell’s best form has only ever really been seen at international level with Costa Rica, where he has managed to pick up 75 caps and score 15 goals in total. He was on show for his country this summer in Russia too, but any hopes supporters had of him returning to Arsenal this season for one last crack at the big time have now been dashed by his move to Italy.